Falcon 9 is a two-stage rocket powered by liquid oxygen and rocket grade kerosene (RP- 1). It was designed from the ground up by SpaceX for the reliable and cost-efficient transport of satellites to low Earth orbit and geosynchronous transfer orbit, and for sending SpaceX's Dragon spacecraft, including manned missions, to orbiting destinations such as the International Space Station. Falcon 9 saw its first successful launch on June 4, 2010, and its second on December 8, 2010. Made in America: All structures, engines, avionics, and ground systems designed, manufactured and tested in the United States by SpaceX. Falcon 9 with a Dragon spacecraft is 48.1 meters (157 feet) tall. The vehicle from the COTS 2 flight is capable of producing one million pounds of thrust in a vacuum. 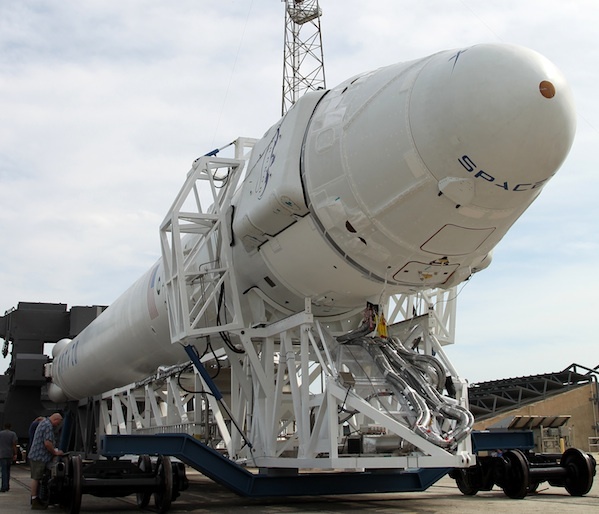 Cutting-edge technology makes Falcon 9 the vehicle of choice for commercial and government customers. SpaceX has approximately 40 Falcon 9 missions on the manifest. Named for the Star Wars Millennium Falcon; 9 refers to the nine Merlin engines that power the first stage; one Merlin vacuum engine powers the second stage. Designed from day one to safely carry crew. Achieved 100% mission success on its first two flights (June 2010 and December 2010). The first rocket completely designed in the 21st century; developed from a blank sheet to first launch in four-and-a- half years (November 2005 to June 2010) for less than $300 million. Advanced design for maximum reliability. Falcon 9 features a simple two-stage design to limit separation events, and with nine engines on the first stage, it can still safely complete its mission in the event of an engine failure. The main causes of launch failures are stage separation events and engine failures. The Falcon 9 tank walls are made from an aluminum lithium alloy. SpaceX manufactures the tanks using friction-stir welding, the strongest and most reliable welding technique available. Nine SpaceX Merlin regeneratively cooled engines power the Falcon 9 first stage. After ignition of the first-stage engines, the Falcon 9 is held down and not released for flight until all propulsion and vehicle systems are confirmed to be operating nominally. The interstage, which connects the upper and lower stages for Falcon 9, is a composite structure with an aluminum honeycomb core and carbon fiber face sheets. Falcon 9 uses an all-pneumatic stage separation system proven on its predecessor, Falcon 1. The second stage tank of Falcon 9 is simply a shorter version of the first-stage tank and uses most of the same tooling, material and manufacturing techniques. This results in significant cost savings in vehicle production. A single Merlin engine powers the Falcon 9 upper stage. For added reliability of restart, the engine has dual redundant pyrophoric igniters using triethylaluminum-triethylborane (TEA-TEB). Falcon 9 is powered by nine Merlin engines in the first stage and one in the second stage. The nine Merlin engines generate one million pounds of thrust in vacuum. The Merlin engine was developed internally at SpaceX, but draws upon a long heritage of space proven engines. The pintle-style injector at the heart of Merlin was first used in the Apollo program for the lunar module landing engine, one of the most critical phases of the mission. Propellant is fed via a single-shaft, dual-impeller turbopump operating on a gas generator cycle. The turbopump also provides the high pressure kerosene for the hydraulic actuators, which then recycles into the low-pressure inlet. This design approach eliminates the need for a separate hydraulic power system and means that thrust vector control failure by running out of hydraulic fluid is not possible. A third use of the turbopump is to provide roll control by actuating the turbine exhaust nozzle (on the second-stage engine). Combining three functions into one device that can be verified as functioning before the vehicle is allowed to lift off provides a significant improvement in system-level reliability. Before the spacecraft even reaches orbit, Falcon 9 must once again perform successfully. Of the world’s current launch vehicle families, 75% have had at least one failure in the first three flights. An analysis of launch failure history between 1980 and 1999 by Aerospace Corporation showed that 91% of known failures can be attributed to three causes: engine failures, stage separation failures and, to a much lesser degree, avionics failures. With nine Merlin engines clustered together to make up the first stage, the vehicle is capable of sustaining an engine failure and still successfully completing its mission. This is an improved version of the architecture employed by the Saturn V and Saturn I rockets of the Apollo Program, which had flawless flight records despite losing engines on a number of missions. With only two stages, Falcon 9 limits problems associated with separation events. And SpaceX has an incredibly advanced avionics system. SpaceX uses a hold-before-release system — a capability required by commercial airplanes, but not implemented on many launch vehicles. After the first-stage engine ignites, the Falcon 9 is held down and not released for flight until all propulsion and vehicle systems are confirmed to be operating normally. An automatic safe shut-down occurs and propellant is unloaded if any issues are detected.